Tripura’s newly anointed Chief Minister Biplan Deb has recently donned the media spotlight after making certain ill-structured statements like asking youths to raise cows or open paan shops instead of chasing government jobs and taking on former Miss World Diana Hayden to claim that she didn’t deserve to win the title. 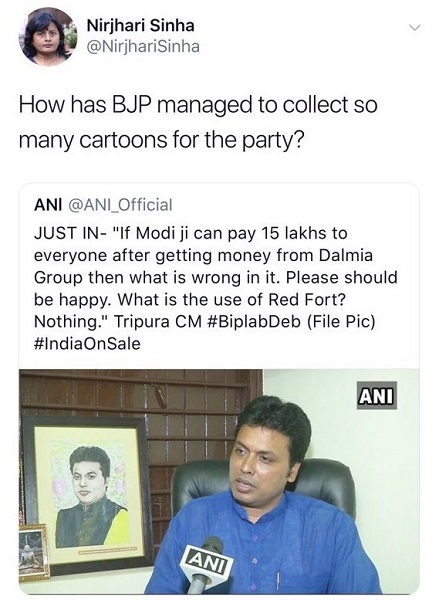 The parody twitter named @ANI_Official, which looks strikingly similar to the real twitter accounts namely @ANI and @ani_digital, managed to stump a few people including a prominent journalist, who jumped the gun to castigate CM Biplab Deb for the said statement. 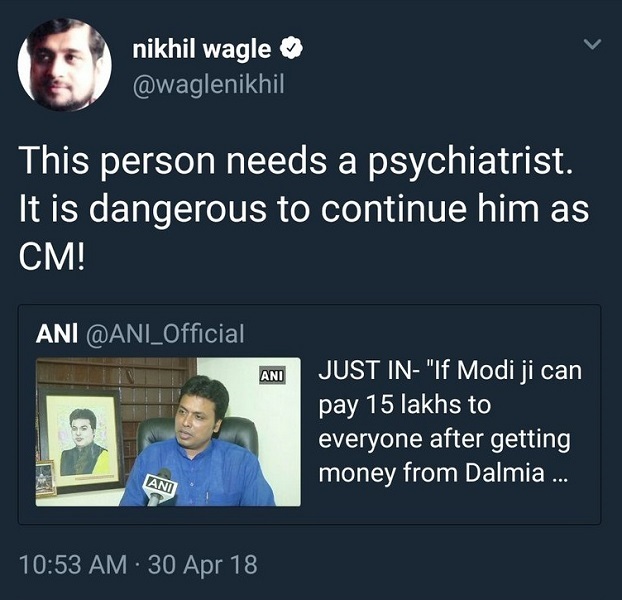 He soon realised his mistake and deleted the tweet but this didn’t stop him from taking a parting jab on the Tripura CM. Those falling for it also includes activist Nirjhari Sinha who as per her own admission is a Director in Pravda Media Foundation, which is a parent company of alleged fact checking website Alt News. Based on this blooper, it remains to be seen whether Alt News, which is run by her son Pratik Sinha fact checks her now deleted tweet, as the media website has indeed in the past ‘busted’ about parody tweets going viral on social media. This episode though has failed to impress ANI Editor Smita Prakash who has accused the parody account of peddling fake news and illegally using the logos of her news agency. Incidentally, this isn’t the only time a tweet by a parody media account fooled journalists. We had reported how a parody account’s tweet posting an imagined response to the controversy surrounding lyrics of a viral Malayalam song, stumped various journalists.